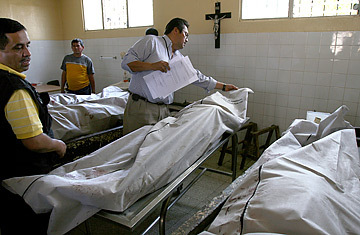 Morgue workers inspect the bodies of four slain police officers in a prison, at Cuilapa's morgue, near Guatemala City, Guatemala, February 26, 2007. Just as President Bush plans to visit Central America, the demons of corruption, drug dealing and murder there that have long been kept under wraps, either by official complicity or negligence, are beginning to attract public scrutiny. Eight brazen and grisly murders three Salvadoran congressmen and their driver, and four Guatemalan policemen have shaken the two countries' governments and shed light on the criminal underworld operating with impunity from inside police forces. The scandal began two weeks ago when the bodies of the congressmen, who were representatives to the Central American parliament, and their driver were found bullet-ridden and charred on an abandoned dirt road in Guatemala. Days later, four Guatemalan policemen  including the head of the organized crime investigation unit  were accused of the murders. But before they could be tried for the crimes, the four were assassinated inside their maximum-security prison cell, left face down in a pool of blood, shot with their throats slit. Authorities and opposition politicians in Guatemala say the policemen were part of a group operating within Guatemala's security forces who were responsible for drug trafficking and death-squad style killings. The four were murdered before they could reveal the full extent of their allegedly illegal activities. "They were killed to keep the lid on Pandora's box," said El Salvador's chief of police Rodrigo Avila. The reputations of the conservative governments of Tony Saca in El Salvador and Oscar Berger in Guatemala, two of Washington's few remaining allies in Latin America, have taken a severe hit. The countries share a southern border and have two of the strongest economies in Central America. Both are members of the Central American Free Trade Agreement and are seen by the U.S. as partners in the war on drugs. Just last fall the Bush Administration nominated Guatemala to take the Latin American seat on the U.N. Security Council as a means of shutting out Venezuela. The U.S. government says the seven-country region, a land bridge between South America and Mexico, has become a major transit route for over 75% of cocaine moving from Colombia up through Mexico and into the U.S. The fallout from the ongoing investigations, now being conducted with the help of U.S. FBI agents, will surely cast a shadow over the visit later this month of President Bush to Guatemala, his second-to-last stop on a five country tour of Latin America. For Berger, it means a failure of his campaign promise four years ago to clean up Guatemala's politics, notoriously corrupt since the country's 36-year civil war ended a decade ago. During that war, which claimed nearly a quarter-million lives, the Guatemalan military launched a scorched-earth counterinsurgency campaign against leftist guerillas, massacring entire Mayan villages accused of supporting the rebels. Many wartime figures were never prosecuted for their offenses, and human rights groups and the U.N. have warned that former state security forces  laid off after the peace accords mandated a downsizing of the military  could be involved in the drug smuggling rings. Although mystery still shrouds the deaths of the three Salvadoran deputies, Berger said that "a drug-trafficking gang with ties to both countries" was responsible. On Friday, the country's top police investigator, who was in charge of the policemen accused of murdering the congressman, resigned. And it will be seen in the coming weeks if other top Guatemalan officials, including the police chief or the interior minister, will be the next to go. Saca, too, may be in hot water if it is determined that the three dead congressmen were themselves involved in drug trafficking. The murdered politicians, Eduardo D'Aubuisson, William Pichinte and Jose Ramon Gonzalez, belonged to El Salvador's ruling Nationalist Republican Alliance party, known as ARENA. All were members of the regional parliament, which has 132 members representing five of the seven Central American nations. Based in Guatemala City, the parliament, known by its Spanish acronym PARLACEN, has been mired in drug-trafficking scandals in recent years. In 2003 a Honduran member of the body was convicted of trafficking several kilos of heroin in his car. Eduardo D'Aubuisson was the son of ARENA's founder, Roberto D'Aubuisson, who was accused of heading death squads during the 1980s civil war. The elder D'Aubuisson, who died in 1992, was found by a U.N.-backed truth commission to have ordered the 1980 assassination of Roman Catholic Archbishop Oscar Romero. His son and colleagues were murdered on the 15th anniversary of D'Aubuisson's death from throat cancer. The interior minister of El Salvador, Rene Figueroa, who is collaborating on the Guatemalan investigation, is the vice president of the ARENA party and a personal friend of the murdered congressmen. He said at a press conference that his goal was to clear the name of the politicians. But such close connections have raised questions about the objectivity of any investigation that either government will be able to carry out. That is why the Guatemalan government, with the leading voice of Vice President Eduardo Stein, has repeatedly stressed the need to create the International Commission against Impunity in Guatemala (CICIG), a U.N.-backed independent body that would be allowed to investigate high-level government corruption in the country. The proposal for the commission has been around for years but has failed to build up enough support to allow its passage in Congress. Authorities and human rights activists say it is the only way Guatemala will be able to uncover the full extent of illegal armed groups operating in the country and finally be able to prosecute high-profile officials responsible for the crimes. An inept justice system means that only 2% of the more than 5,000 murders each year are investigated in Guatemala. CICIG could be the country's only hope at changing this culture of impunity.